Find out how Armorcoat® safety film can protect you. Unfortunately we live in a world where bomb blast is a real danger to our safety and security. A bomb blast turns unprotected glass into dangerous flying shards. Lacerations due to high-velocity flying glass fragments have been responsible for a significant portion of the injuries received in explosion incidents. During a blast, glazing will break causing serious injuries. Blast pressures can carry broken glass at speeds in excess of 100 feet per second (68 MPH). Amorcoat film provides you protection against the negative effects of solar radiation. With Armorcoat safety film, applied to your existing glazing, we can help you drastically increase your level of protection and save lives. 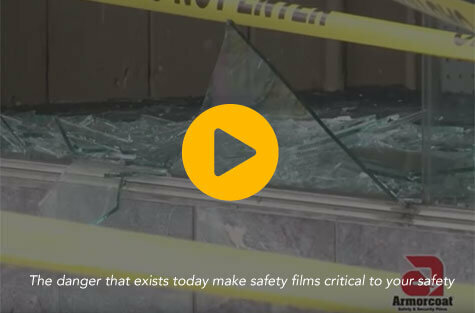 Solar Gard Armorcoat safety film helps to reduce the risks of flying glass that can cause severe injuries or death during an accidental explosion or terrorist attack. Armorcoat creates a protective barrier protecting the people inside of targeted and surrounding buildings from the effects of a blast. Solar Gard: Armorcoat is made by Solar Gard, an industry expert in film and coating solutions for more than 40 years. Armorcoat has been rigorously tested to globally recognized standards, including GSA, ISO and ASTM. Our business partners provide a consultative approach. They will ultimately provide the best option for your specific window frames, situation and building, be it Armorcoat or (combined with) other options such as e.g. blast curtains, laminated / safety glass. What is the GSA standard and how does Armorcoat perform against it? 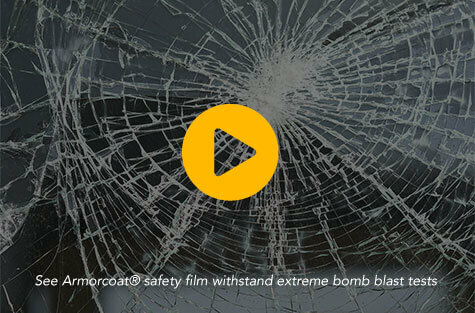 See how Armorcoat safety films can protect people from the dangers of broken glass as tested to industry recognized blast standards. How can I assess blast risk for my organization / building? Learn about the steps the government takes to protect their employees and buildings from various security risks utilizing defined security measures. Please visit our Resources Page for product specifications, test reports and educational documents.